Men, don't trust 'em! The Uwaki Kareshi (THE 浮気彼氏) or "The Cheating Boyfriend" is built around the idea of confronting your wayward love. During the investigation mode, you search your boyfriend's room for suspicious items like, oh I dunno, women's perfume or a hostess's business card. Then, you confront the guy and try to catch him in a lie. Based on the mobile game, the 3DS version is a ¥300 (US$3.33) download title and features 3D effects and gyro controls, that allow you to chuck things at your boyfriend by shaking the 3DS. 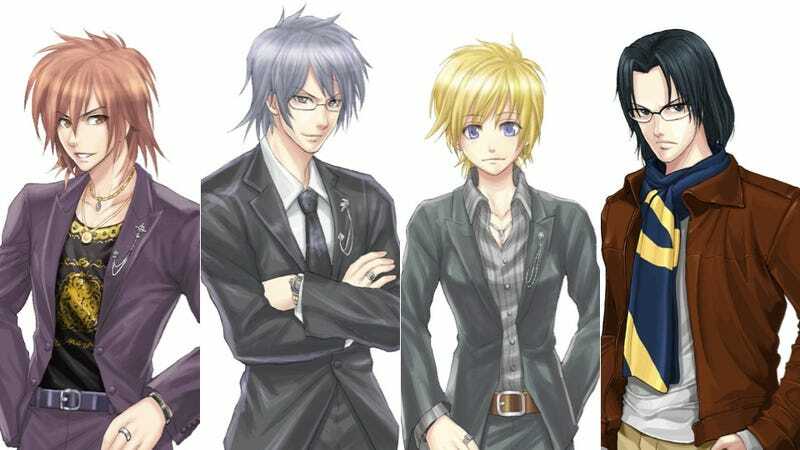 It also features these four men. And their hair. The Uwaki Kareshi is available for the 3DS from January 30.